It has taken eight months, the lives of at least 712 Bunyan Marsous fighters (three of them in the final 24 hours) and the wounding, sometimes catastrophically of 3,210 more, but today the guns fell largely silent over Sirte as the last IS terrorists were killed or surrendered. There was confusion this morning when one spokesman for the BM operations room declared the battle over only to be contradicted by another who said there were still pockets of resistance. But even one or two hold-out gunmen could not disguise the final victory. At least a dozen surviving terrorists surrendered while their dead comrades were dragged from buildings and laid in a line. Terrified women and children scrambled over rubble to reach BM lines, where after at least one female suicide bombing in recent days, fighters were now extremely watchful. Pictures were posted of dehydrated children being cared for by medics. The final collapse of resistance may have had something to do with yesterday’s intense air onslaught. US Africa Command said there had been 15 airstrikes on 42 different terrorist positions. This brought to 492 the number of air raids the US has launched since it began supporting BM operation on 1 August. The beachside properties in which IS made their final stand and much of the surrounding Ghiza neighbourhood have been reduced to rubble. Washington said in September that its anti-terrorism air mission were being extended from Sirte to the rest of Libya. It is now accepted that even before the Mistratan-led advance on Sirte, an organised group of IS fighters escaped in May. In April terrorists had attacked and occupied the key Abu Grain junction with the road leading to the south. It was not until three weeks later that BM forces were able to retake the position. 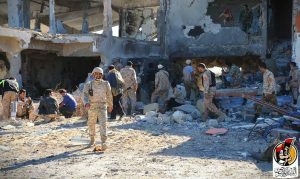 Since then other terrorists are thought to have slipped through BM lines, even around Sirte itself, where cooperation and coordination between different units was not always evident. Proof of this may have come with a claim this evening from IS that it had ambushed two tanks at Check Point 60 (Buwabat Siteen) 60 kilometres south of Misrata on the main southern highway beyond Tawergha at the junction with the road heading west to Bani Walid. There has been no comment from BM on the report. The terrorists claimed to have killed 18 BM fighters in this ambush and in the final fighting in Sirte.